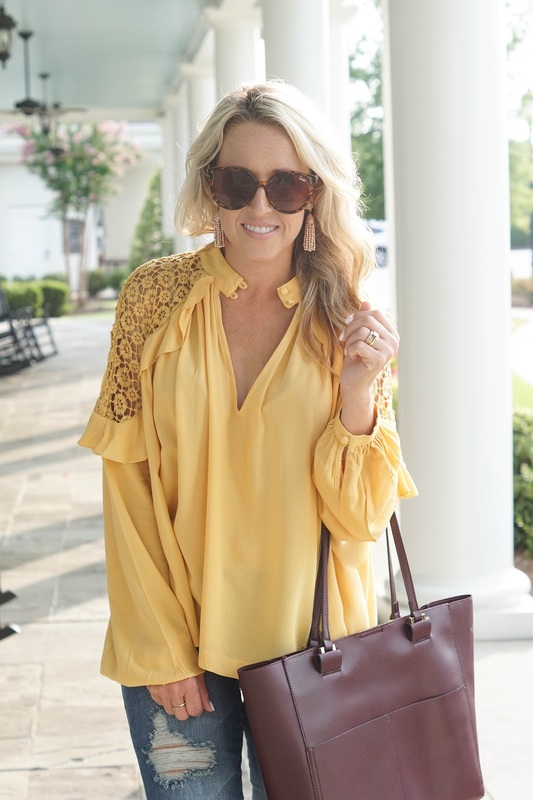 The popular color of golden yellow this Summer is sticking around for Fall! And it looks lovely with burgundy, brown and olive green. 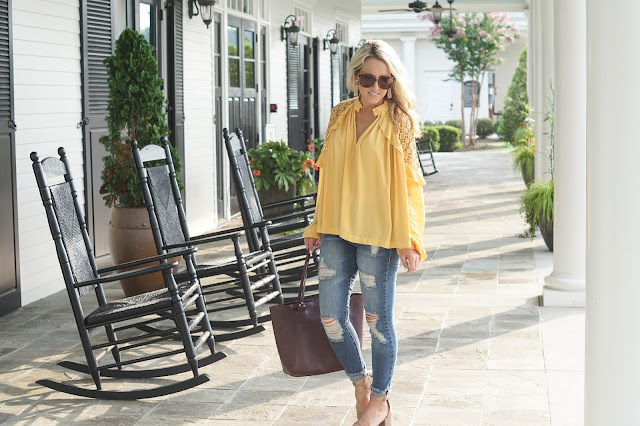 It seems so strange to be sharing Fall clothes and colors while it is still 100* outside, but with the Nordstrom Anniversary Sale still going strong and the amazing Fall pieces that are new and on sale, it's the perfect time to start buying. Some of my look is from the sale, like this gorgeous tote. I love the deep burgundy color, but it also comes in black. It's the softest leather too, with side pockets!! 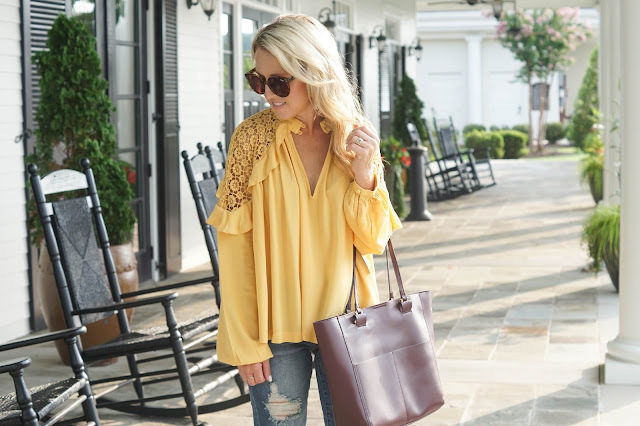 My yellow lace and ruffle top is a piece that can transition from Summer (with jean shorts) to Fall (distressed jeans). It comes in 4 colors, including a gorgeous pink and classic black. I've seen it worn both this way and backwards, with the v-neck in the back. That gives the blouse a high neck look. Both ways are pretty, but I think v-neck tops are super flattering. This weekend was a blast. 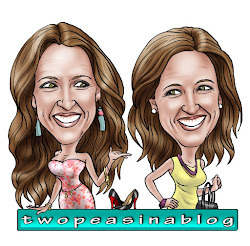 We had Katey, her husband and the kids all at our house. They were on their way down to Charleston, and stopped at our place for a couple nights. Like I said, the weather here was a hot 100*, so we spent Saturday at our parents neighborhood pool!! The kids love it because it has a fun slide! The pool or staying inside is about the only choice in this heat. I'm loving yellow this year for sure! This is such a simple, ultra cute outfit! 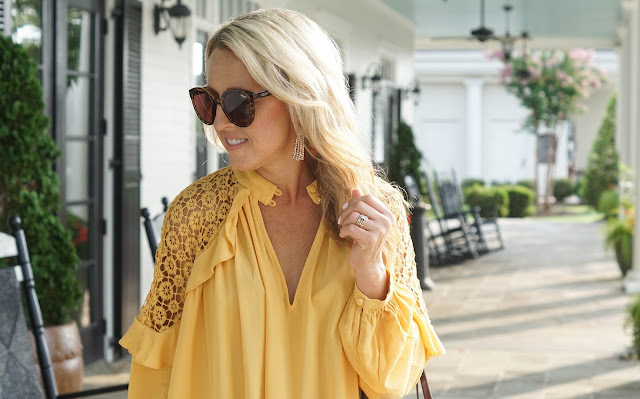 I love how a fun top elevates the look. I'm cracking up at my IG feed full of girls wearing their NSale goodies in full Summer heat. Last year I was bummed to be traveling during the sale, so I missed out on several pieces, and paid full price for others. Yay for family time! I'm sure your parents were over the moon to have everyone there! Worn out kids, falling asleep at dinner is the best kind of fun too!! Wow, this top!! I don't even know where to begin. It is beyond stunning and I love the simplicity yet elevated touch it brings to the outfit! I love your lace top and the color is perfect for fall!